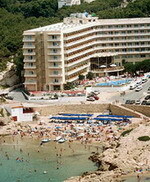 The Hotel President is located in Salou, Spain, 70 metres from the beach. The railway station in the centre of town is 200 metres away. Port Aventura theme park is three kilometres. Designed in a contemporary style with a neutral colour scheme, the Hotel President has a lounge with cream sofas, and a roof terrace area with large hot tubs and a sauna. The hotel restaurant serves breakfast, lunch and dinner. 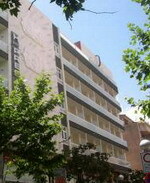 It offers a selection of international dishes. There is also a ground-floor cafeteria with terrace area. Breakfast is complimentary, and half-board rates are also available. Services include bicycle hire and ticket- booking. A 24-hour room service is available. There is also live music in the restaurant at weekends. 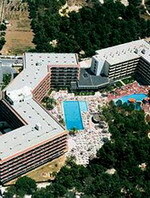 The 56 air-conditioned guestrooms all have balconies, some with views of the sea. Rooms have wooden laminate floors and blue bedspreads with matching curtains. 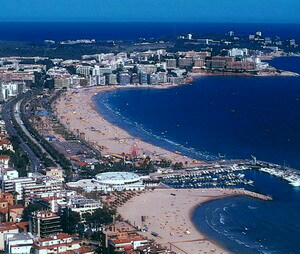 Salou is a family holiday resort situated on the Costa Dorada, around 50 miles (80km) south-west of Barcelona. 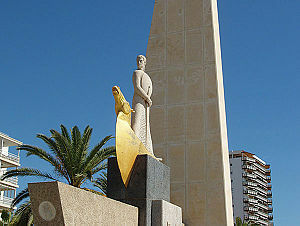 The town's biggest draw is the main sandy beach, Playa Levante, which is clean and well-maintained. 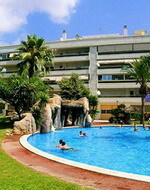 It also boasts calm and shallow water making it ideal for children. Playa Levante has excellent facilities including lifeguards, snack bars, sun beds and a first aid post. Salou has several other good beaches, most notably Playa de Poniente which borders the neighbouring resort of Cambrils, and the pretty little Playa de Capellans which is overlooked by cliffs. If you are into waterspouts there are plenty of choices available at the marina, including scuba diving, water-skiing, windsurfing, jet-skiing and kayaking. Another of Salou's important landmarks is the 16th century watchtower of Torre Vella, which was built to help protect this stretch of coastline from attacks by pirates. It now houses a municipal museum and regular art exhibitions, while the tower's gardens contain Adoma Puig's sculpture of the three maidens. For an insight into the area's rural heritage, the Masia Catalana is worth visiting. This is in fact a modern reproduction of a typical Catalan farmhouse, but one that was built using traditional methods. Inside are exhibits which trace the evolution of farming methods through the centuries. For younger visitors the nearby Port Aventura, regarded by many as one of the best theme parks in Europe, is a must-visit. There is plenty here to keep thrill-seekers happy, including the Dragon Khan rollercoaster and Grand Canyon Rapids, as well as more gentle rides for small children. The park is based on the theme of five worlds: Mexico, Far West, Mediterranean, Polynesia and China. Adjoining Port Aventura is the Costa Caribe water park. There is also a small funfair at the end of Passeig Jaume I with traditional rides such as the big wheel.